Rothay Garden Hotel HotelWelcome to Rothay Garden. 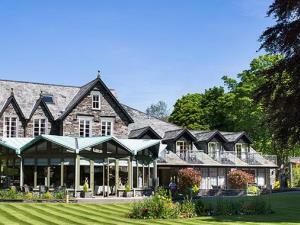 This delightful Lakeland hotel, overlooked by majestic fells in the vale of Grasmere, is surely the perfect choice to enjoy a holiday in Cumbria’s English Lake District. Our elegant conservatory restaurant which overlooks 2 acres of riverside gardens is a delightful setting to enjoy our renowned 5-course dinner. To complement your meal we have a wine list that reaches all corners of the world. 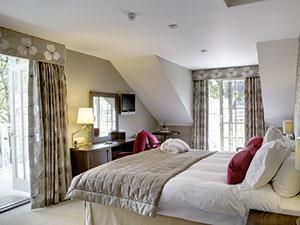 Our comfortable and attractive bedrooms enjoy every, modern facility required by todays discerning guest. Superior rooms also include feature beds, whirlpool baths, and settees and are particularly spacious. Grasmere the home of Wordsworth for many years is both the geographical and cultural centre of the Lake District. There is much to see and do around the village with so many picturesque walks and every valley being within a short journey. No children under 5 in restaurant in evening. Leisure facilities 7 minutes drive. Children welcome from any age. 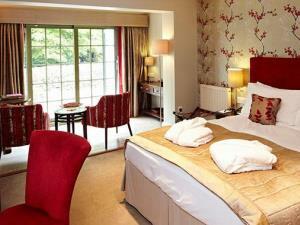 Rothay Garden Hotel sometimes limits bookings to 2 or more days. The luxurious Loft Suites are all named after the lovely views from their windows – Butter Crag (our Premier Loft Suite), Loughrigg and Silver Howe (Loft Suites) and Stone Arthur and Helm Crag (Junior Loft Suites). These second-floor suites are beautifully individual, particularly spacious and have original beams, King-size beds, stylish bathrooms, comfortable seating areas, two flat-screen TV’s, air-conditioning, free WiFi, fine linen, bathrobes, ethical toiletries, and a complimentary welcome tray with a choice of teas, coffees and mineral water. And even binoculars in the Suite for viewing the beautiful mountains and fells surrounding Grasmere! 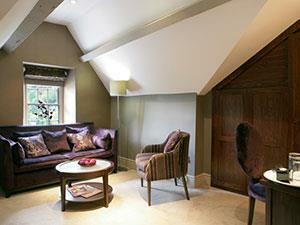 Fell Loft Suite sometimes limits bookings to 2 or more days. Luxurious Grasmere rooms are available on the first floor of the hotel and are very spacious with King-size beds and either separate shower and bath, or a shower over the bath. Grasmere rooms also have stylish bathrooms flat-screen TV, free WiFi, bathrobes, ethical toiletries and a complimentary welcome tray with a choice of teas, coffees and mineral water. Many of the Grasmere rooms have balconies, and either overlook the surrounding fells, the river Rothay, or the hotel gardens, and with their extra space make an ideal base for a short or longer break. 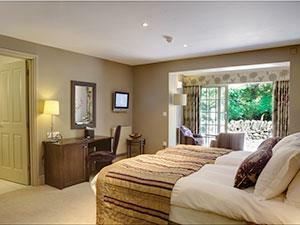 Grasmere Double sometimes limits bookings to 2 or more days. Langdale rooms also offer guests staying in these rooms bathrobes, slippers, ethical toiletries, free WiFi, multi-channel flatscreen tv, and a complimentary welcome tray with a choice of teas, coffees and mineral water. These rooms are mostly situated on the first floor, have balconies and are generally larger than Rydal rooms. They have stylish bathrooms, with either a shower over the bath, or a spacious shower room without bath. Langdale Double sometimes limits bookings to 2 or more days. There’s no doubt about it – the Riverside and Garden Suites, with their spacious bedrooms, are some of the loveliest rooms in the hotel. The choice is yours, between the Riverside Suites with their peaceful sitting areas with French doors opening onto the river Rothay, or the Garden Suites, with their sun-lounges and patios overlooking the hotel’s two acres of gardens. The Riverside and Garden open-plan suites are beautifully individual in their design, and have King-size beds, stylish bathrooms, separate comfortable seating areas, flat-screen TV, free WiFi, fine linen, bathrobes, ethical toiletries and a complimentary welcome tray with a choice of teas, coffees and mineral water. Riverside Suite sometimes limits bookings to 2 or more days. From north follow A591 to Grasmere, turn right at Swan Hotel, 300yds on left. From south A591 to Grasmere, turn left at Swan Hotel, 300yds on left. Train to Windermere, 555 bus through to Grasmere.